We invite you to join @NatParNet in our monthly chats on Twitter. The next in our monthly one-hour online chats will be held Monday, February 17, at 7 p.m. PST (8 p.m. MST, 9 p.m. CST, 10 p.m. EST). This month’s party is all about gardening — so share your tips and questions for the spring! We’re going to have a fun line-up of prizes. Plus, RSVP below through the Rafflecopter form below and you’ll be automatically entered to win a door prize, whether you attend the party or not! OrganicGardening offers a wealth of information for gardeners of any background, whether you’re planning your very first garden or are a seasoned gardener with years of growing under your belt (and your knees! 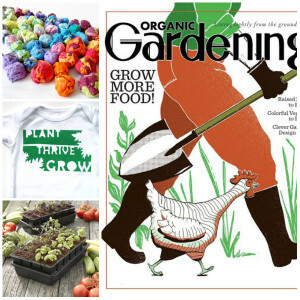 ), they have beautifully written articles to help you make this year your very best, and your garden truly organic. 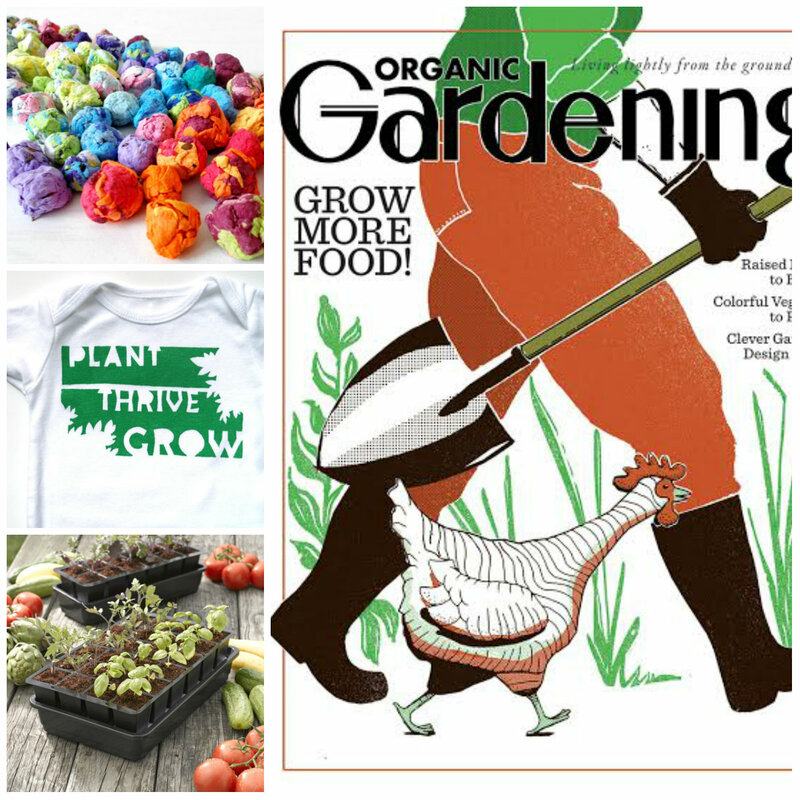 Two readers will win a year-long subscription to Organic Gardening, with 6issues each. This magazine is a must-have for any gardener in your life! Subscribe today. 5 lucky winners will receive Seed Starting Grow Kits from Gardeners Supply Company. These amazing trays help your seeds sprout quickly in a convenient, self-watering system. Simply add water and the eco-friendly coconut coir pellets expand to fill each cell, and your seeds! The biggest problem for home seed starting is over- or under-watering, but not with these trays! Just fill the reservoir and plants get the water they need, when they need it. Includes an extra-sturdy, leakproof reservoir, platform and planting cell tray that are all dishwasher-safe, making them easy to clean and sterilize between uses. A clear germination cover maintains proper humidity while the seeds are germinating. The support platform that holds the planting cells doubles as a seedling ejector. Buy one here! A kid’s onesie or shirt in PLANT THRIVE GROW print from MoMo Pics on Etsy! This adorable onesie celebrates all that is wonderful about digging in a garden; being so close to nature and all things fresh. Everyone loves springtime, when flowers start wiggling their way up to bloom, and the smell of freshly turned earth warmed by the sun. Buy one for a baby you love today and celebrate gardening in style! We’re giving away three seed bomb kits from Paper Sprouts on Etsy! These seed bombs are colorful and fun, and perfect for kids! Seed bombs have caught on as a quick, eco friendly method to garden. Toss them wherever you need a bit of color, water and wait for them to sprout. Use these to decorate a table, add to favor bags or keep them in your pocket to celebrate gardening anywhere you go. Buy a pack of 50 seed bombs for just $18. Our #NaturalParents Twitter parties inform, empower, and inspire. 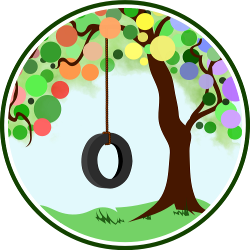 Learn more about attachment parenting and natural family living. Make new friends and discuss topics that are relevant to your family. What do you do to join in the fun? Follow @NatParNet on Twitter — we’d love to connect with you! Then follow the #NaturalParents hashtag on the night of each party. You can jump into the #NaturalParents room on Tweetchat so you can follow and tweet along more easily. Thank you to volunteers Erica (@ChildOrganics), CrunchyConMommy (@CrunchyConMom), & Mb (@Natural_Reviews) for organizing and hosting the Twitter parties! Sounds fun! I’ll try to make it! Very excited to be a part of this! Thanks! Love is in the air~Im exited. Im still very new to parties** I hope i win a diaper 🙂 Thanks for hosting a great giveaway! heres to hoping i can figure out tweetdeck as ive never used it.